The Dukan Diet — yet another low-carb, high-protein diet allegedly used by Duchess Kate Middleton and Jennifer Lopez – has become one of the most popular diet trends this year. Created by French Dr. Pierre Dukan more than thirty years ago, it didn’t enter the public spotlight until the release of his book The Dukan Diet in the U.K. in 2010, and the U.S. in 2011. Instead of a short-term weight loss solution, the Dukan diet promotes itself as a plan to redesign your eating habits, permanently. The goal is to first determine your “true weight” –a weight you can realistically reach and maintain with the program. Consisting of four phases, the eating plan also incorporates 20-30 minutes of physical activity a day, such as walking or working out in a fitness center. 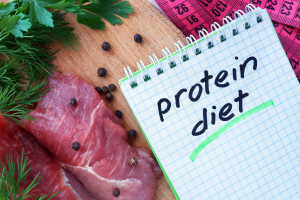 This phase limits you to 68 pure protein foods, but you may eat as much as you like. Depending on how much weight you want to lose, the phase lasts from 2-7 days. This is supposed to kick-start your weight loss with immediate, noticeable results. The second phase, consisting of 3 days for every pound you need to lose, is designed to maintain weight loss at a steadier rate by reincorporating 32 vegetable choices in addition to protein. Vegetable and protein days are alternated with protein days for maximum results. The Dukan diet acknowledges that in most diets, this is the point when it’s easiest to lose resolve, and re-gain weight. To prevent this, the consolidation phase returns ‘forbidden’ carbohydrates and fats back into the eating plan, allowing for small quantities of fruit, whole grain bread, and healthy fats in foods like cheese. It even allows up to 2 cheat meals a week, but maintains one ‘pure protein’ day each week. but This phase lasts 5 days for every pound lost in the previous Cruise Phase. The fourth and final phase of the Dukan diet is designed to last indefinitely. Having incorporated the previous phase principles creates new eating and exercise habits that enable its followers to maintain weight loss long-term. As we said, the diet also sets up a flexible exercise schedule of at least 20 minutes in a fitness gym during the first phase, 30 minutes a day in the second phase when foods are re-introduced, 25 in the third, and back to 20 during the final maintenance phase. In addition to the approved food lists for each phase, diets must consume a range of 1.5-3 tablespoons of oat bran each day. Some nutritionists, including those in the British Dietary Association, criticize the Dukan diet for being too restrictive and unsustainable. Diets that restrict or completely cut food groups are often hard to maintain long-term, and also create challenges to ensuring well-rounded nutrition. Although the diet is not considered dangerous to follow, the most frequent complaints relate to the food restrictions. In spite of daily oat bran, some complain of constipation from lack of fiber and low energy from lack of carbohydrates and B-vitamins. Dieters may also need to take a multivitamin/ mineral supplement. On the other hand, most health and fitness experts agree that the absolute best diet for each individual is the one you’ll be able to follow consistently. If the Dukan diet fits your needs and lifestyle, and looks like something you can maintain long-term, it may be worth a try. The fact that it promotes daily exercise in a health club is certainly a plus.